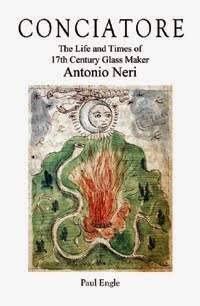 In his 1612 book, L’Arte Vetraria, Antonio Neri describes preparing batches of 300 to 400 pounds of a blue-green colored glass destined for beadmakers . The molten glass was drawn out into thin rods and cooled for use by workers who formed beads by winding the glass around a metal rod over an oil lamp. I demonstrated this method of making aquamarine in Florence in the year 1602, at the Casino, and I made many batches of it for beadmaking cane, which always resulted in a most beautiful color. Take note, than in Murano for beadmaking cane they take half crystal frit and half rocchetta frit, and nevertheless still get a nice aquamarine; but in pure crystal it is the most beautiful. Elsewhere, we learn that Neri supervised the production of beadmaking cane, not only in Florence, but also in Pisa. At that time, glass beads were manufactured for use both within Europe and for use around the world as a trade currency. 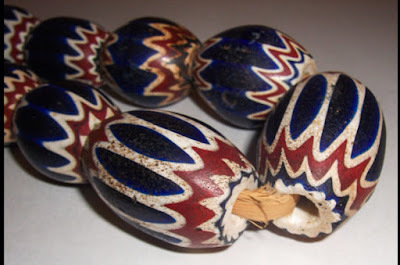 Locally, beads found use in devotional objects in the form of rosaries, where they were called ‘conterie’ and ‘paternostri’ (literally 'our fathers'). Outside of Europe, in Africa, the Americas, the Far East, and in China, glass beads were used in trade for sugar, spices and other goods. On the darker side of history, they were used to buy men, women and children for the slave trade. The question of Neri’s involvement in the production of trade beads naturally arises, but it is a question not so easily answered. He makes no direct mention of the intended use of the beads made from his glass, but there are clues. On one hand, the Medici family, for whom Neri worked in Florence and Pisa regularly engaged in trade expeditions, on the other hand Neri himself was a Catholic Priest, with some obligation to the Church. His work could as easily have been destined for foreign shores as for the hands of the laity. Neri’s good friend, Emmanuel Ximenes came from a family of traders, or “bankers” as they were called at the time. They financed expeditions to Africa, India and the Americas. Glass beads were not the only goods used in trade, but they were relatively inexpensive to manufacture and made a convenient ballast material for ships. Empty vessels needed something heavy in the cargo hold to keep the boat from riding too high in the water. Often rocks or sand was used, but barrelfuls of glass beads served the double purpose of a near universally accepted currency. It is easy to imagine Neri’s friendship with the wealthy banker facilitating trade deals, but no evidence has come to light that anything like this took place. Antonio Neri visited his friend Emmanuel Ximenes at his palace in Antwerp and stayed for about seven years. It might seem like an ideal opportunity for bead production, except that the port at Antwerp had been blockaded by their Dutch neighbors to the north for several years. They were fighting a bloody war for independence from Spain and any trade that did occur had to be routed to other ports. Emmanuel’s brother Duarte had a large shipment of sugar confiscated in this period and went to considerable trouble to have it returned. This does not rule out a role for Neri in trade beads, but it does make it less likely than when he was living in Italy. There is also no evidence that I am aware of that the Ximenes were involved in the slave trade. It is true that Emmanuel was a Knight of Saint Stephen, which essentially served as the Tuscan Navy. They regularly intercepted Ottoman pirate and military ships and when caught, the crew was generally pressed into slavery. However, this was not a profit driven activity and by the time Neri and Ximenes met, the later was well beyond the age of active service. Neri 1612, chs. 22, 26, 29, 36, 46, 47, 62, 64, 65. For a full description of the 1602 Sugar Confiscation, see Roitman 2009, pp. 207–229. * This post first appeared here 17 Dec 2014.